A-frame metal mailbox by Babco. Produced in the 1950s in Los Angeles California. It includes a retractable red flag to notify the postal carrier of outgoing mail. Repainted. The red flag shows wear to the original finish. Lightolier desk lamp with perforated metal pivoting shade. Includes the original and rarely-seen metal bulb diffuser. Brass arm and handle. Original finish in great condition. 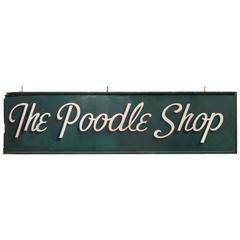 This masonite sign hung in a Westchester, NY beauty parlor in the 1950s. Carved walnut architectural panels circa early 1960s. 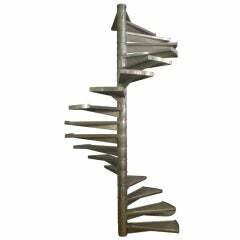 These are perfect as headboards, architectural accents or screens. Price listed is for all three. 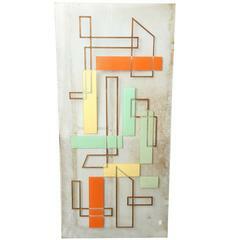 Architectural glass, handpicked by Ann-Morris buyers. These are very nice pair of architectural finials made of resin. These were made for theater work. Very decorative items could be used in doors or out doors. 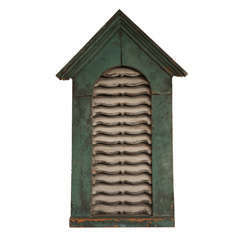 Charming carved and painted wood architectural element in original green and weathered white paint. Scalloped vent with crown molding top. A maritime architectural element of painted and carved wood representing Neptune.